A single-bike accident can be an incredibly frustrating situation for the rider of a motorcycle. This type of accident often involves “phantom vehicles” that leave the scene of the crash or stationary objects. A motorcycle rider may feel as though he or she has no chance of pursuing a responsible party for damages, but the reality is that a motorcycle attorney can assist in this matter. 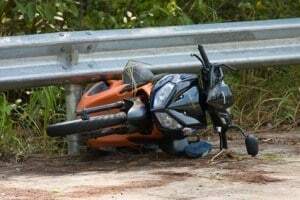 Motorcycle accident lawyers can help in tracking down the individuals that may be negligent and responsible for leaving stationary objects in areas that could easily cause collisions with motorcycle riders. A single-bike accident frequently occurs when a vehicle also flees the scene before a motorcycle rider can receive that driver’s information. The driver likely wants to evade liability for causing the accident, so he or she thinks it is best to flee the scene. The reality is that fleeing the scene can carry civil and criminal penalties, and motorcycle accident lawyers are ready to assess these penalties on your behalf. If you have been injured in a single-bike accident, then you can speak with an Illinois motorcycle accident lawyer about your legal rights today. It is vital that you do not delay in getting the legal help that you need. Call our attorneys now to receive legal advice about your legal rights and the possibility of settling your case or filing a claim. How Can I Avoid Involvement in Single-Bike Accidents? Motorcycle riders have a few measures that they can take to avoid involvement in single-bike accidents or minimize the risk of damages. Bikers should pay attention to conditions on the road at all times to prevent accidents. Riders should be aware of any hazardous areas that are blocked off for construction. Motorcyclists should also avoid driving in lanes not clearly marked. Potholes can also pose a danger to motorcycle riders on the road. Bikers should swerve to try to prevent driving into potholes if at all possible. It is not always possible to avoid a crash with a vehicle or collision into a stationary object. If a rider finds that he or she has crashed into a fixed object or another vehicle, their best response is to remain calm. Motorcycle riders often install cameras on their bikes that can record every second of an accident and ensure that a biker can capture images and other information about others involved in the collision. If a rider does not have this type of tech gadget installed on a bike, then the rider should calmly call the police and try to get the information of the other driver. At the very least, a rider should try to record the license plate information of a fleeing driver with a smartphone or pen and paper. It is also important for riders to contact a motorcycle accident attorney if they have been involved in a single-bike accident. A lawyer who has experience litigating motorcycle accidents may know what a biker should say to an officer who is investigating the scene of a single bike motorcycle accident. A lawyer may also guide a victim in dealing with insurance companies after a single bike motorcycle accident. You should be aware that anything that you say to an insurance company claims adjustor will likely be recorded and may be referred to by the insurance company’s legal team. Your damages could be reduced depending on what you say to an insurance company. Single-bike accidents can be prevented when cities ensure that road conditions are safe for the average driver or motorcycle rider. Also, motorcycle riders may be able to avoid collisions by paying attention to other swerving drivers on the road. If a rider notices that another driver is driving peculiarly, then he or she should try to leave space between that car and the motorcycle. Illinois motorcycle accident attorneys at Rosenfeld Injury Lawyers LLC are ready to handle your legal case. Whether you have just been injured in an accident or are not sure how to proceed in your case, call our lawyers for help today. Our lawyers are ready to deal with any obstacles that may arise in your case and will approach your legal issues with the utmost diligence. Contact us today!